When is the last time a corporate event really surprised you? Or the last time it wasn’t just a sit-down dinner with some speeches, a comedian and maybe a DJ late into the night? Now there is nothing wrong with this, in fact there is a reason this is a tried and tested formula for corporate events – it works and it doesn’t raise eyebrows. However, we’d like to present you with something slightly (or really far) out of the box if you’re looking for something a little more unusual. In this month’s newsletter we’d like to challenge you to build a festival with us for your next event. Yes, a festival. Imagine your guests being transported to a carnival atmosphere, populated with unique entertainers and acts that delight at every turn. Instead of the usual five-course meal, food trucks are on deck to serve up snacks, while guests are free to explore and interact with all the performers - a throwback to the wonder of visiting fairs and circuses in their youth. This works incredibly well for family events and fun days too! So feel free to adapt the plan as we go along. So, what sort of entertainment should you book for your festival? Well first of all start with a few magicians who can surprise guests with feats that defy logic. Try a mentalist to wow the crowd and get them talking – no better ice breaker than two people trying figure out a piece of magic. Why not make the highlight of the night a hypnotist who will astound with hypnotic hilarity on stage. Yes there will be a stage, of course, not all acts will be in the crowd. There should be a draw card after all, especially when you need everyone focused on one spot for speeches or awards, should there be any. 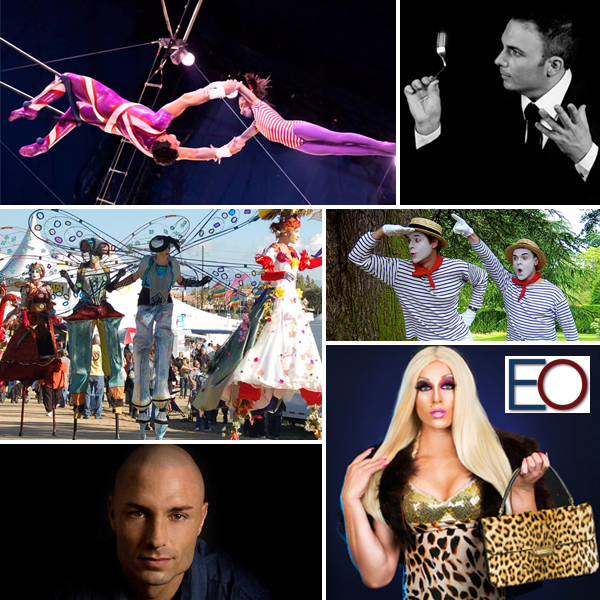 Next up, our festival will be populated with circus acts and buskers. Don’t go overboard here as more intricate rigs can cost more and take up more space. However a few buskers like stilt walkers, jugglers and mimes will only add to the atmosphere of the event. And to really light up the night, fire dancers can be brought in round out the festival theme. Let us help you pick the right performers for your event, by working with your needs and ideas in order to generate suggestions. So you’ve got some magic and some whimsy, but what about bringing the glamour with a drag queen to MC your festival? Brimming with comedy and very sharp wit, they are the perfect ring leader for your night. Of course the glamour and humour can also be brought to the stage with a cabaret performance. The choice is yours. Another benefit to a DIY festival is that it can be an open-air extravaganza, saving you costs on venue rentals. With acts starting from R2500, you can afford to wow your corporate crowd with more than the usual MC, dinner, DJ and comedian. Now, we know this sounds like a laundry list of performers, and, booking and managing all these acts seems daunting, but at Entertainment-Online, that is what we do. We will help you find the perfect entertainers for your festival or fun day. Why not reach out to us and let us help you break out of the box and create a corporate event that people will talk about for years to come. Lastly before closing out this newsletter, we would like to congratulate Ryan from Twins on Deck on his marriage. Congratulations Ryan, we wish you and your wife many happy years together.